And I will walk 175 miles…. Following on from his epic London to Paris bike ride back in 2014, trustee Jonathan Mason will be challenging himself once again, but this time on more familiar soil! 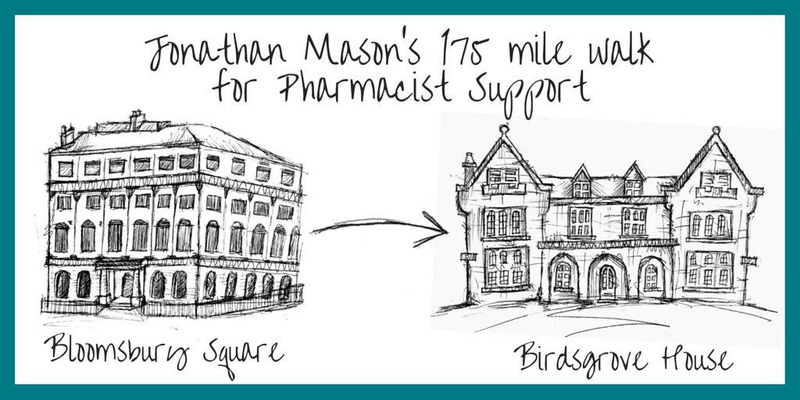 Ditching the bike in favour of boots, Jonathan will be walking 175 miles from Bloomsbury Square, the original HQ of the Royal Pharmaceutical Society, to Birdsgrove house to raise money for Pharmacist Support. What was your inspiration behind this 175 Miles walk? As a trustee of the charity, I wanted to do something special for the 175th Anniversary. Initially, I thought about doing a bike ride, but decided that a 175 mile or 175 km ride would be too easy. The idea of walking 175 miles was to me a greater challenge! I hadn’t decided on a route, but when I talked to my partner, Sara, about the walk, she suggested walking between places that meant something to pharmacy, which is where I came up with the idea of walking from the original Pharmaceutical Society HQ in Bloomsbury Square (where the Benevolent Fund as we were then known was conceived), to Birdsgrove House in Derbyshire, which many pharmacists will be familiar with as a place of convalescence and recuperation for those in the profession, run by the charity until its sale in 2006. Emma Peate, Pharmacist Support’s Fundraiser, came up with the idea of visiting England’s oldest pharmacy, Reaveley’s, in Burford, Oxfordshire, so I devised a 175 mile route that goes from London to Burford, and then onto Derbyshire. I am walking as much as I can at weekends, and am running most evenings to increase the strength in my legs. My friend, Pritpal Thind, is joining me for the walk, and he is doing lots of walks to prepare. He is currently in San Francisco, which is good for walking – lots of hills. Tell us a bit about the route and the places you will be stopping off at? We leave Bloomsbury Square on Saturday the 4th June, and will walk 25 miles to Beaconsfield. En route, we will stop at Pritpal’s pharmacy in Shepherd’s Bush, which will be a good place for lunch. The second day’s route takes us from Beaconsfield to Wheatley, over the Chilterns. Day three sees us walking from Wheatley to Burford. The owner of Reavley’s Pharmacy, Cedric Reavley, has offered accommodation for the night of the 6th June. The fourth day takes us from Burford to Ettington, near Stratford-Upon-Avon. On the 8th June, we walk from Ettington to Meriden. The sixth day’s route takes us from Meriden to Burton, where we plan to savour some of the local ales. The final day sees us walking from Burton to our final destination, Birdsgrove House. Anyone can join you on all or a bit of the walk, how can they get involved? People can contact me via Twitter @jonathanmason, or can visit the Facebook page for the walk. You can join us for part of the walk, on any day. Each day’s route is published on the Facebook page, so people can help by providing refreshments if we are passing by. When you make it to Birdsgrove House how do you plan to celebrate?! Crack open a bottle of champagne, and then head for the nearest pub for a well-earned pint and a sit down! You can visit and donate on our Just Giving page . All support most welcome! Thinking of fundraising for Pharmacist Support? Contact our fundraiser Emma Peate on 0161 441 0317 or emma.peate@pharmacistsupport.org for information, tips and a 175 Hero Power Pack!